Visit JackKellyBooks.com for all the latest! Truthfully, I had a hard time putting it down…and cried at the end.
. . . the kind of book I will keep and read again. A real page turner . . . Concise, dramatic and fast moving . . . This is the best military history I have read. It reads like a novel. I rate this as a great book! Extremely well researched and presented. It moves along at a fast pace . . . I have read many books on this period but none tells the story any better . . . 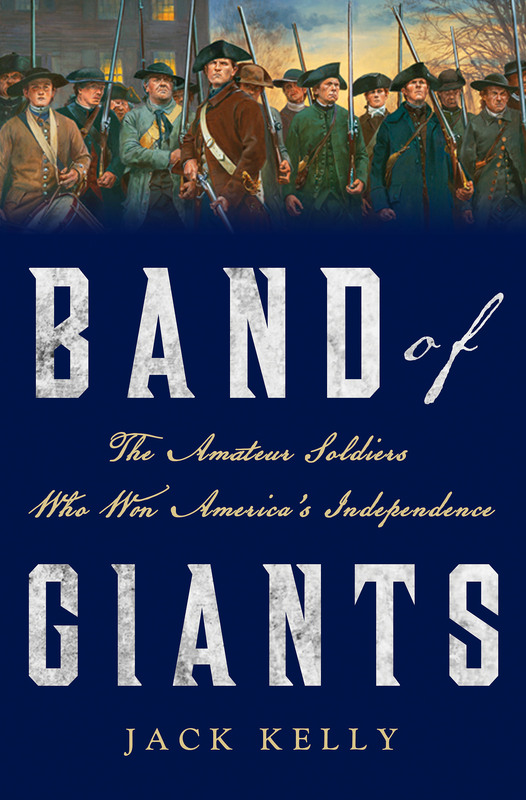 Band of Giants brings to life, in a vivid and moving narrative, the founders who fought for freedom and the great war that secured our independence. Jefferson, Adams and Franklin are known to most Americans — men like Morgan, Greene and Wayne are less familiar. Yet the ideals of the politicians only became real because fighting men were willing to take on the grim, risky, sometimes brutal work of war. We know Fort Knox, but what about Henry Knox, the burly Boston bookseller who took over the American artillery at the age of twenty-five? Eighteen counties in the United States commemorate Richard Montgomery, but how many of us know that this revered martyr of the Revolution launched a full-scale invasion of Canada only months after the war broke out? The soldiers of the Revolution were a diverse lot: merchants and mechanics, farmers and fishermen, paragons and drunkards. A few were trained military men, most ardent amateurs. Even George Washington, assigned to take over the army around Boston in 1775, went out and bought a book on military tactics. That these inexperienced warriors could take on and defeat the superpower of the day was one of the remarkable feats in world history. “We have lived an age in a few years,” said one who experienced those turbulent times. Band of Giants gives readers a taste of the sheer intensity of experience that lit the minds of the revolutionary fighters. It examines the decisions, mistakes, fears, risks, and emotions that weighed on the men who led the effort. It draws attention to the fraught conditions under which the patriots fought — the bitterly divided populace, the lack of supplies, the repeated setbacks on the battlefield, and the appalling physical hardships. The troops often fought without blankets, shoes or food or pay — yet they endured and, miraculously, won.